The evocative tale of Alice In Wonderland is not only full of whimsical charm but totally unforgettable, making it the quintessential inspiration for a wedding. The story pushes the boundaries, challenging the concept of the norm…hello? Did somebody say photo shoot? “Why sometimes I believe in as many as six impossible things before breakfast”- The Queen. 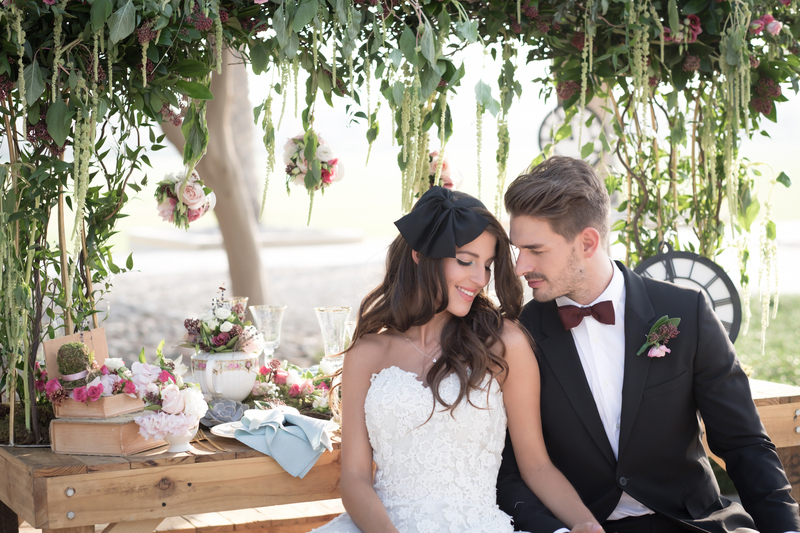 You will love this Wedding Haven photo shoot by Paula Scalco and Joem Aldea that was held at the Polo Club in Dubai! “You're entirely bonkers. But I'll tell you a secret. All the best people are.” – Alice. Our ‘Alice’ for the day and her Prince were the beautiful and charming Tamara and Rafael. Tamara wore two enchanting lace numbers from the Bridal Showroom Dubai. While Rafael opted to wear a black suit with a subtle golden tie for the first look. For his second look, he wore a deep red tie which looked equally stylish with his dark colored suit. With the help of the amazing Monica from MHG Beauty, we styled Tamara's first look with a contrasting black version of the iconic Alice band, and for her second look we decided to go with a delicate beaded headband provided by The Bridal Showroom. Blush Beauty Inc kept our model’s hair and make-up fresh and youthful whilst adding a touch of the classic Alice in Wonderland icey blue to the eyes. “Do you suppose she’s a wildflower?” – Daisy. Firenze Flora created a beguiling suspended garden over the table place. The upside-down meadow became a retreat at the heart of the show. The flower arrangements teamed with the surrounding greenery of the Polo Club Dubai resulted in a stunning woodland garden being created for the photo shoot. “It’s always tea time” – The Mad Hatter. Party Social gave a nod to the romanticism of the Victorian era with the delicately beautiful mint table napkins alongside a rustic wooden table and benches. Whilst the party’s clocks and old key elements certainly added to the fun and playful element to this wedding photo shoot. “If you don’t know where you’re going, any road will get you there” – Cheshire Cat. Check out these pretty invitations by Creative Box. And the icing on the cake was… the cake! Crafted by Nice Ribbon Atelier, it screamed “eat me”. The work of art enhanced theatricality the photo shoot, whilst being full of exquisite details. “In my world, the books would be nothing but pictures” – Alice. The Wedding Haven specializes in creating and planning one of a kind destination weddings that are inspired by the couple's own story, uniqueness, and experiences.